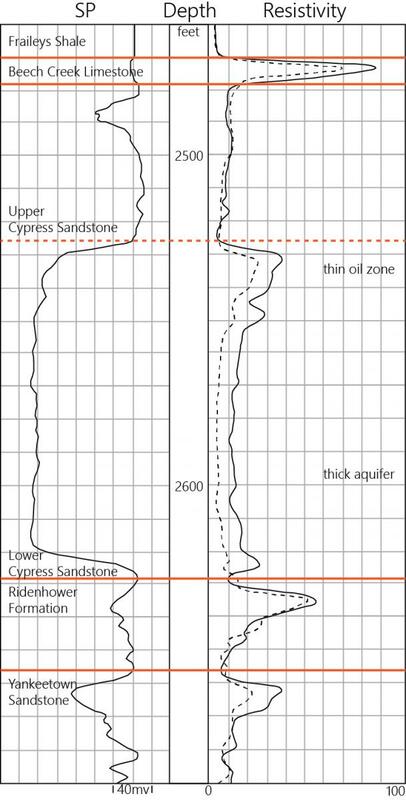 Figure 1: This single-point and resistivity log shows the Illinois Basin (ILB), where the top of thick sandstone in the Cypress Sandstone contains thin oil reservoirs, which are underlain by strong bottom-drive water aquifers. Residual oil zones (ROZs) have been the target of successful carbon dioxide enhanced oil recovery (CO2-EOR) programs in the Permian Basin of West Texas. However, the United States Department of Energy’s (US DOE’s) Carbon Storage Program seeks to shift the carbon balance for CO2-EOR to net carbon negative oil (NCNO), a situation in which a greater amount of carbon is stored in a geologic medium than is being produced from CO2-EOR. As such, research is underway to investigate CO2-EOR operations for reservoirs that have the potential to store large quantities of CO2 while still producing additional incremental oil. Variations in ROZs include relatively thin mobile oil columns immediately above a relatively thick and mobile water-saturated formation. In the Illinois Basin (ILB), thin oil reservoirs occupy the tops of thick sandstone reservoirs and are underlain by strong bottom-drive water aquifers (Figure 1). These reservoirs are nonconventional CO2-EOR targets because underlying brine aquifers are notorious for “stealing” the CO2 from injection wells and thus preventing CO2 from interacting with oil and enhancing oil production. This type of reservoir is a very good example of an oil reservoir that has significant storage potential and CO2-EOR capabilities that may not be attempted without a storage option. This study aims to research the oil reservoirs often found in the upper portions of thick sandstones, namely the thick fluvial deltaic facies of the Chesterian (Upper Mississippian) Cypress Sandstone in the ILB (Figure 2). 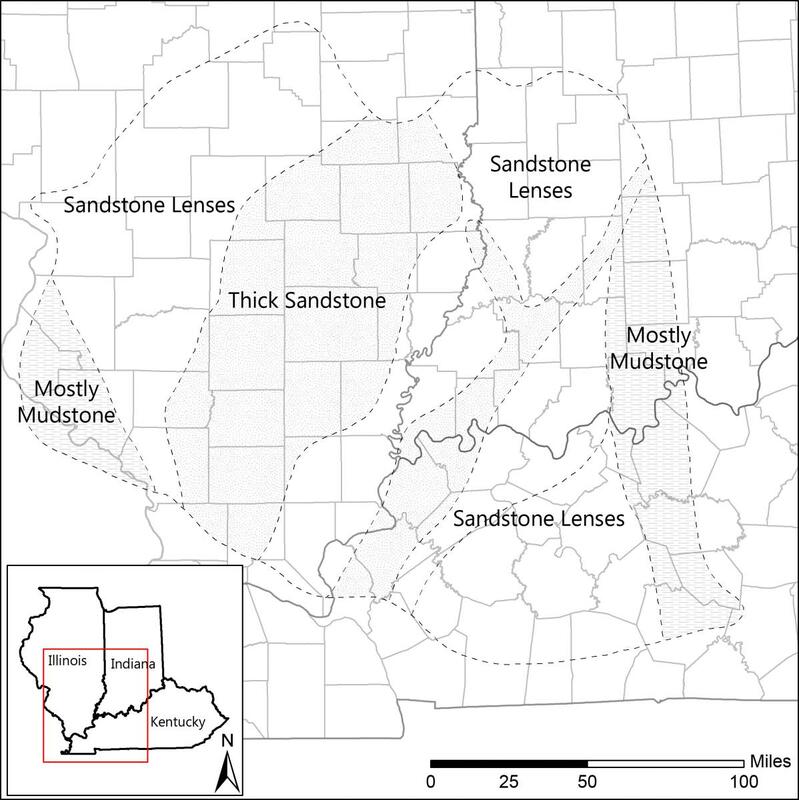 Since 2008, the Midwest Geological Sequestration Consortium (MGSC) has included the portions of the ILB with thick Cypress Sandstone present in its saline storage portfolio. In the Fairfield Basin, the central deep portion of the ILB, where the Cypress occurs below a depth of 800 m, the thick fluvial deltaic facies of the Cypress Sandstone is so extensive that it has the potential to store as much as 0.2 to 2.3 billion metric tons of CO2 (DOE, 2012; Figure 3). Thus, thick Cypress Sandstone reservoirs provide the promise of increased oil recovery in response to CO2-EOR with the potential for storage of significant volumes of CO2. Figure 2: The different oil producing horizons in the Illinois Stratigraphic column. 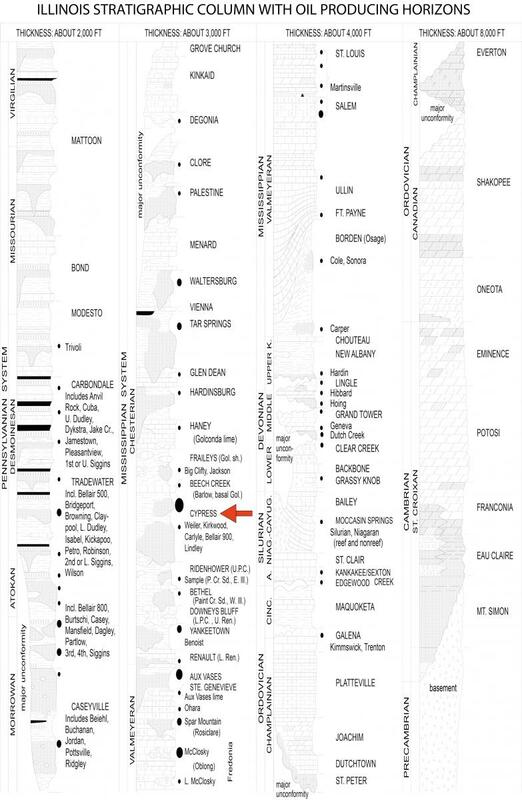 The location of the Cypress Sandstone is indicated by red arrow. This study includes detailed geologic reservoir characterization to define CO2 storage potential, residual oil saturation, and CO2-EOR feasibility of oil reservoirs within the thick Cypress Sandstone of the ILB. Reservoir characterization is a critical step in understanding the ability of the reservoir to store CO2 while producing additional incremental oil. The reservoir characterization and facies classification study will consist of examinations of core and outcrop to detail sedimentological features, petrography using thin sections and scanning electron microscopy (SEM), and bulk and clay mineralogy. Petrophysical analysis of old and newly acquired geophysical well logs will show how sedimentary structures, rock fabric, and diagenetic properties relate to reservoir flow properties. Geophysical well logs will be used to create cross sections and structure and isopach maps of the reservoirs. Analysis will be performed on oil and brine samples from the study area to model the interactions of CO2 with the formation fluids. Geocellular models will be created based on the geologic criteria and interpretations developed in the geologic reservoir characterization study. Models will integrate structure and isopach maps with normalized spontaneous potential curve data, acting as a proxy for porosity and permeability when core-measured data are plotted to create a transform and used to populate the reservoir within the model. By working closely with project geologists and integrating their honed geologic interpretations into the geocellular model development process, the resultant model will be the most accurate representation of the actual reservoir characteristics as possible. The geocellular models can then be taken into the reservoir simulation and calibrated to historical production data so that they reflect the completion practices that have been used historically. Differing well pattern, spacing, and orientation scenarios will be simulated along with differing perforation selections and injection profiles to determine an optimal combination for the reservoir in question to maximize both oil production from the thin oil reservoir and CO2 storage in the underlying water-saturated portion of the formation. NCNO will be estimated for each projected CO2-EOR development scenario. Figure 3: The regional extents of the Cypress Sandstone. Through careful geologic reservoir characterization, geocellular modeling, and reservoir simulation based on actual reservoir parameters and formation fluid properties, methods for improved sweep and storage efficiency through injection will be developed. In order to optimize both, careful attention will be paid to the vertical distribution of oil within the formation and the application of specific CO2 injection profiles to ensure conformance control. Cursory economics will be completed so that the relatively high storage component anticipated from these formations can be understood in terms of the magnitude of the CO2-EOR. Lessons learned from this study may be extrapolated to other formations of a similar depositional setting within the ILB as well as other sedimentary basins within the United States.